If you're looking for a stylish crossover that doesn't cost a lot of money, be sure to check out the 2019 Jeep Compass. With the arrival of upgraded standard features, it's now an even better bargain. Drivers who enjoy off-road expeditions should definitely consider the adventurous Trailhawk model. While the Compass has a lot of adoring traits, you can't overlook its weak areas. Let's find out how well the new Compass stacks up against today's other compact SUVs. The 2019 Jeep Compass now comes standard with an upgraded touch-screen display. For the first time, you can also get adaptive cruise control. Furthermore, some buyers will be interested in the crossover's new appearance packages. A lot of car shoppers will be attracted to this SUV's inexpensive price tag. You can get the base Sport model for less than $22,000. 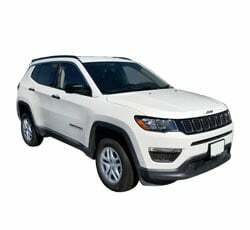 This low starting price makes the 2019 Jeep Compass a great alternative to the costlier Jeep Grand Cherokee. Although the base Compass isn't luxurious, it now comes loaded with a more rewarding infotainment system. Some of the other standard equipment includes Bluetooth integration, a six-speaker stereo system, and a USB port. Although the 2019 Jeep Compass isn't a powerhouse, it does reward you with solid fuel economy. According to the latest EPA ratings, manual-equipped models can deliver around 23 mpg in town and up to 32 on the highway. While opting for an automatic transmission slightly lowers the SUV's gas mileage, even the 4WD Compass can return a decent 31 mpg on the freeway. Jeep also recommends the use of regular unleaded gas. While all-wheel drive is available throughout the lineup, the Compass Trailhawk is especially rugged. It's designed for the drivers who'll regularly venture off the pavement. Jeep strapped it with a number of special off-road goodies. While a raised suspension helps you to maneuver around old tree stumps and rocks, a Selec-Terrain system aids this model's ability to climb hills. Some of the other upgrades consist of tow hooks, enhanced underbody protection, and all-terrain tires. A lot of people rave about the Jeep Grand Cherokee's rugged styling. You'll notice quite a few similar styling cues on the 2019 Jeep Compass. Like its big brother, the Compass comes equipped with Jeep's signature seven-slot grille. A new High Altitude appearance package is available for the Limited model, which outfits the Compass with a bold set of 19-inch wheels and Satin Gloss Granite trim. Featuring a gloss-black roof, the new Upland package greatly enhances the base model's curb appeal. In contrast to some of the other small crossovers on the market, the 2019 Jeep Compass doesn't make passengers feel confined. Even adults won't mind sitting in its backseat. There's actually an above-average amount of legroom in the rear. This is a good family vehicle for the daily grind. Because the interior materials are so durable, pets are more than welcome to climb inside. When you need to haul stuff, the SUV's 27 cubic feet of cargo space will come in handy. Every driver will enjoy Jeep's Uconnect infotainment system. While the base interface is easy to use, the upper trims come equipped with an 8.4-inch touch screen with Apple CarPlay and Android Auto. Linking your smartphone is a piece of cake. Because Uconnect is customizable, you can adjust it to suit your personal preferences. If you plan to travel a lot, opt for navigation. Crisp graphics help you to clearly follow the road maps. The standard audio system sounds okay. However, serious music fans will likely desire a more impactful performance. Jeep’s optional BeatsAudio sound system promises to delight your ears. Nine speakers surround the cabin to create an amazing music-listening experience. A 12-channel amp helps virtually eliminate distortion. If you enjoy bass-heavy sound, the system’s booming subwoofer will soothe your soul. Mounted in the center of the gauge cluster, the available digital cluster display gives drivers easy access to a lot of helpful information. Not only can the display show your speed, but it also allows you to view navigation directions. When traveling off-road, you’ll be able to access the Selec-Terrain traction control system. The display can be personalized as well. The 2019 Jeep Compass does offer some beneficial safety technologies. A lot of buyers will be interested in Jeep’s Advanced Safety package. If you don’t respond to a potential crash, forward collision warning with Active Braking will automatically engage. Meanwhile, lane-keep assist prevents you from drifting across the line. Adaptive cruise control also comes in the package. Available blind-spot monitors further help you to dodge danger on the interstate. These days, manual transmissions are not nearly as popular. However, some drivers understand the value of a stick shift. It gives you more control over the vehicle’s performance. Luckily, the 2019 Jeep Compass continues to offer one. You won’t find a manual gearbox on the 2019 Toyota RAV4 or the 2019 Mazda CX-5. In terms of overall performance, the 2019 Jeep Compass ranks behind the competition. Although its 180-horsepower engine feels peppy, a sluggish automatic transmission hurts the crossover’s overall performance. In an effort to conserve fuel, it has a tendency to upshift too soon. Automatic-equipped models take around 10 seconds to hit 60 mph, which is quite slow. If you’re seeking a sportier driving experience, consider getting the Compass with a six-speed manual. When it comes to safety, the new Compass has a few sore spots. Its standard halogen headlights only received a “Marginal” rating from the IIHS. This crossover also received a “Poor” rating for its child seat anchors, which are a bit difficult to use. Furthermore, the federal government gave the Compass a three-star rating in its rollover resistance test. Drivers who need to pull a light load will find the Compass to be perfectly suitable. It can easily tow an ATV. However, the Compass will struggle to move campers and fishing boats. Jeep rates the Compass to tow up to 2,000 pounds. If towing is a big concern, check out the Jeep Cherokee. Although the Cherokee isn’t much bigger, an available V6 engine allows it to pull up to 4,500 pounds. Don’t expect the 2019 Jeep Compass to deliver world-class reliability. Its predicted reliability rating is rather low. This is an especially important factor for the drivers who don’t plan to lease. Expect the 2019 Toyota RAV4 to be far more dependable after surpassing 100,000 miles. Some of the direct competitors include the 2019 Honda CR-V, the 2019 Toyota RAV-4, and the 2019 Ford Escape. When it comes to tackling rough terrain, no other SUV in the segment can hang with the Compass Trailhawk. Meanwhile, a roomier cabin gives the Compass a direct advantage over the Ford Escape. All of three of these rivals pack more performance than the Compass. An optional turbocharged engine enables the Ford Escape to accelerate especially quickly. Questionable long-term reliability puts the Compass a notch behind the Toyota RAV-4. The 2019 Jeep Compass deserves some thought. It’s a versatile crossover that will have no problems handling the daily grind. Although the Compass is a small crossover, it has enough passenger space to accommodate four people. This SUV also packs a lot of style. Drivers who have a passion for off-road adventure should look no further than the hard-nosed Trailhawk trim. While the Compass is considered to be a strong value, it does have some shortcomings. Poor standard headlights and a rollover risk make the Compass less secure than some competitors. Many drivers will also crave more performance than the Compass can deliver.